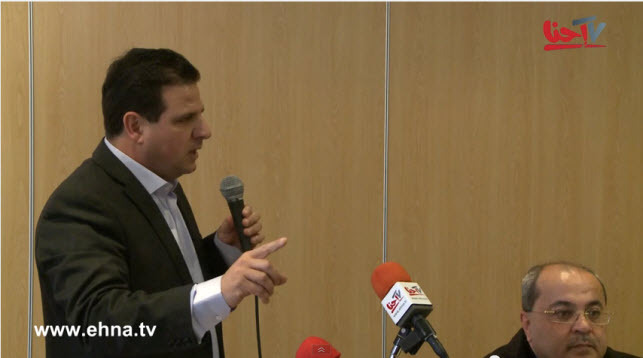 On Friday, January 23, members of the united Hadash and Arab list launched their election campaign with a press conference, one day after reaching an historic agreement to run together in the general elections on March 17. Ayman Odeh (Hadash), number one candidate of the Hadash-Arab parties list, speaks during Friday’s news conference. To the right, MK Ahmad Tibi. “Our list will be the third largest in the Knesset, stronger than that of Lieberman’s Israel Beitenu,” said MK Ahmad Tibi. “We call upon not only the Arab public, but also Jews who believe in our common path, to vote for us. Our list is not in danger, but Lieberman’s list will be in danger.” Lieberman’s racist and extreme-right Israel Beitenu (“Israel is Our Home”) party, has been hit recently by corruption probes and high-profile resignations, and latest polls predict its winning around 6 parliamentary seats, half the number of its current 12. Opinion polls suggest the united Hadash-Arab list could secure between 12 and 17 seats in the 120-seat Knesset. The joint slate, finalized on Thursday, was in large part a bid for electoral survival compelled by the right-wing government’s passing last year of legislation which raised the threshold for entering the Knesset to 4 seats (3.25%). This anti-democratic law left at least two of the four parties forming the list facing the real possibility of being eliminated from representing their voters in Israel’s parliament.